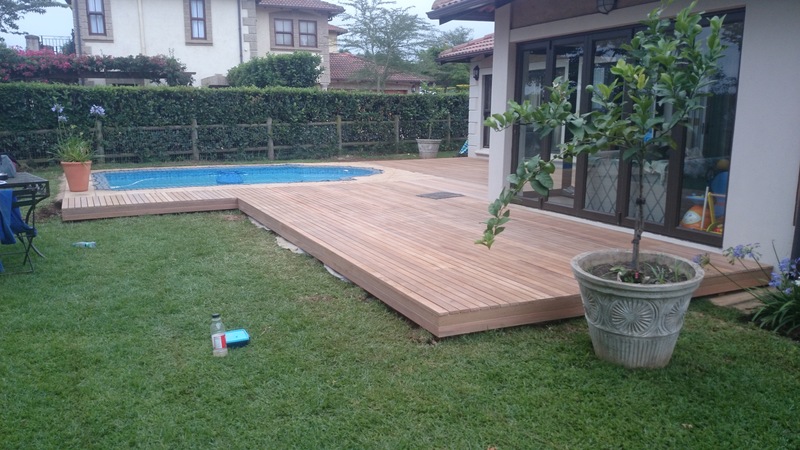 There are a number of different types of wooden balustrades one can have built for your wooden deck. We offer this product in both Durban and Cape Town. I will run through a few options in this article and will mention the pros and cons of each one. There is a slide show above which shows the different options. I do not have fancy names for them such as Colonial, or Mediterranean. I call them simply what they are. The vertical picket wooden balustrades are probably the only ones that are compliant in terms of building regulations as none of the gaps are larger than 100mm. 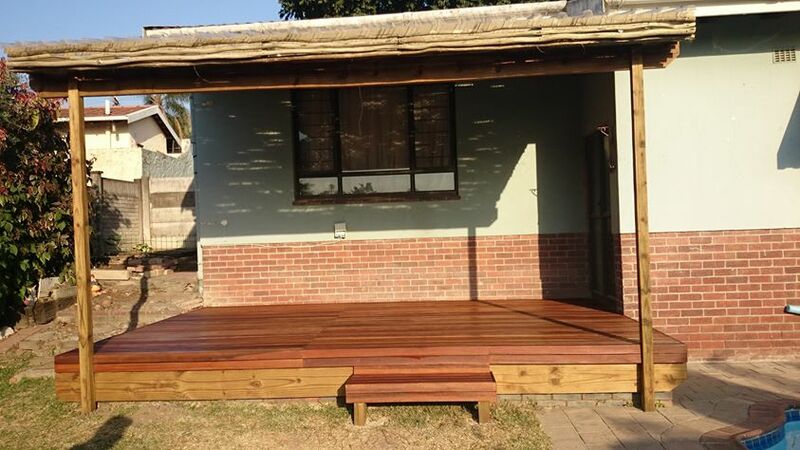 They are generally made from 60 x 60 balau upright posts attached to the fascia beam or first or last joist in a wooden deck. We use the 60 x 60 upright post on the corners and in the middle of a long run. All other intermediary posts are 30 x 60 balau. There is a top rail and a bottom rail onto which the vertical pickets are attached. Rails are generally 30 x 40 and pickets are 20 x 30 balau. The bottom rail is set at 100mm off the deck surface and the top rail can be set either 100mm below the capping, or directly beneath the capping. The capping is generally made from a 30 x 102 balau giving it ample width to place a glass or lean comfortably on it. The capping is then routed to give the corners a rounded edge. The distance between upright posts is determined by the total length of the wooden balustrade resulting in equal spaces between uprights. Pickets too are set at equal spaces between uprights. This is the most affordable design of balustrade as it is fairly simple to construct. The Criss Cross design can come in two main designs. A simple criss cross between uprights with a capping on top or a criss cross between uprights with a box in the middle of the criss cross. The two pieces of timber that are used for the criss cross are normally notched half way through each piece at an angle so that they fit snugly into each other instead of lapping over each other. The box is also set inside the two criss cross pieces so that the whole balustrade is in line rather than pieces over lapping each other. 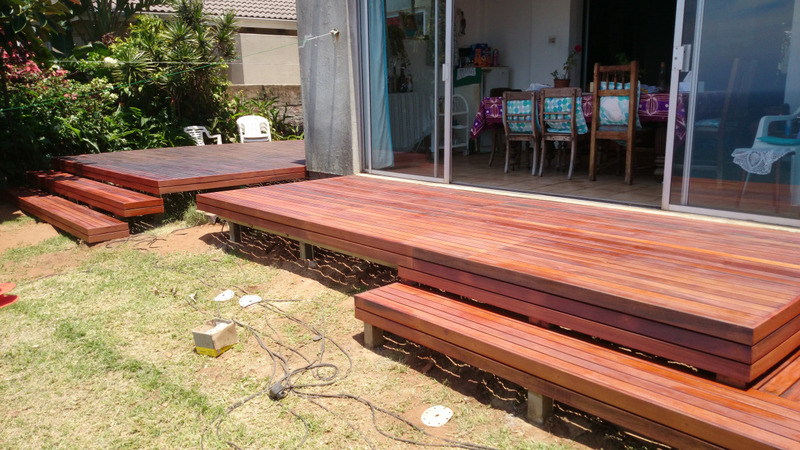 This design can be expensive as the method to construct is time-consuming and the pieces of timber are generally larger than the vertical picket design. It can also be changed to result in many different patterns. The wire rope design is particularity useful when you don’t want to obscure the view when seated. A balustrade at 1m high will block the view in a seated position for most average height people. The wire rope is 4mm in diameter so it is less visible than say a 30mm piece of timber. The posts are generally also 60 x 60 and 30 x 60 uprights with a capping of 30 x 102 balau on top. The wire rope is set at 100mm intervals but can be opened wider as they are not tensioned to guitar string tension. As such they are not suitable if you have small kids and anything over 1m from the deck to ground level. The swages, turn buckles and wire rope are all marine grade stainless steel. 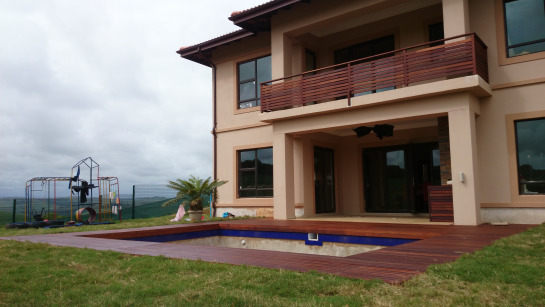 For a free no obligation quote on your timber balustrade requirements please call us on 031 – 762 1795 or use the contact us form below. 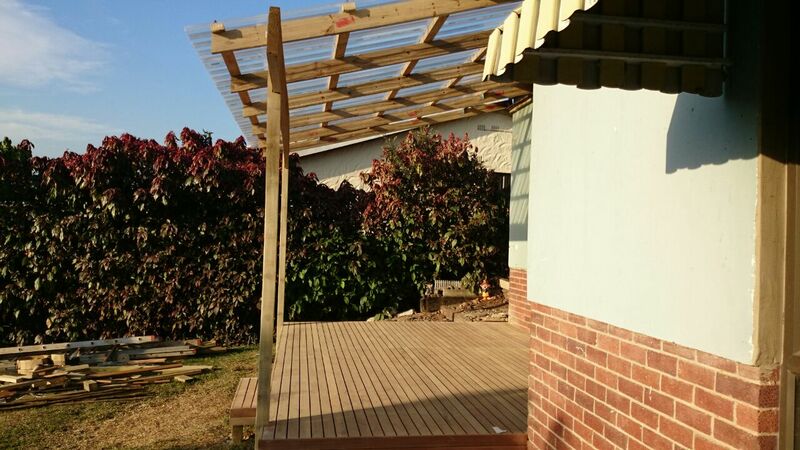 We incorporated a pergola style roof covering into this wooden balau deck we built in Malvern, Durban. 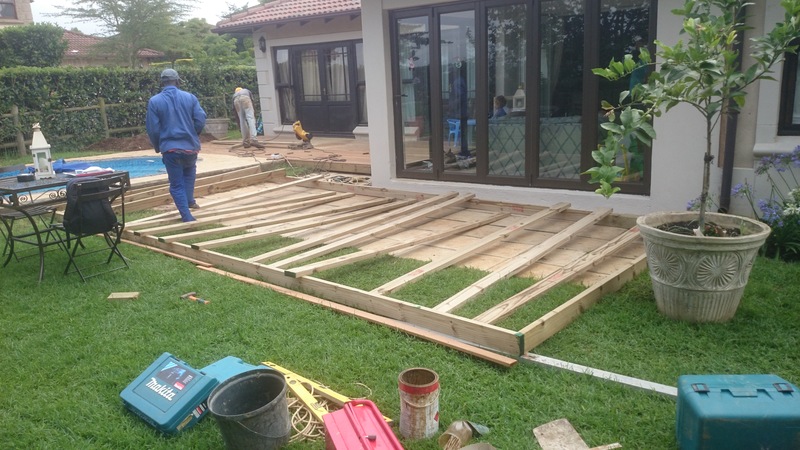 We started with our deck in a normal joist and beam system, but installed our main beam of 50 x 228 on the front in line with the joists rather than slotting it in underneath. This was simply because we didn’t have much space below the deck to slot it in. On the front edge it was fine to use a 50 x 228 beam, but midway across the deck we couldn’t use a 50 x 228 and had to secure each joist to the ground with a small post. It wasn’t a problem though because we were placing it directly on top of the slasto substrate. So there were no holes to be dug and filled with concrete. We then attached two 76 x 76 pine posts, which can also be replaced with balau 90 x 90, to give us some posts to work from for our pergola. Our pergola was built using a 50 x 228 beam on the front, but this could have also have been replaced with a 38 x 152 as there is no real weight on top of the pergola. 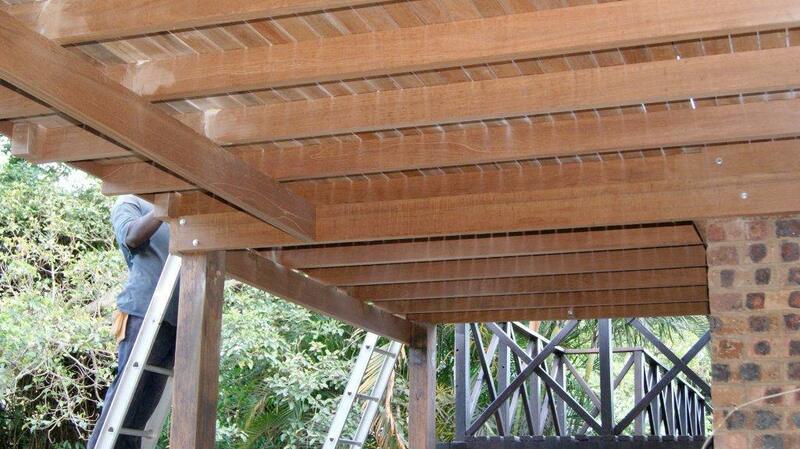 You do get some wind loading from beneath in pergolas with fixed roof sheeting, but not much weight from the top. We only used two posts as our main beam on the front was long enough to span across the 5.2m of the front of the deck. Adding extra posts in between clutters up the front of the deck. We added 50 x 76 purlins and covered that with clear polycarbonate roof sheeting. This allowed the light to still get in but it will be protected from rain. This roof sheeting is however not that attractive from beneath so we clad the underside with thatching laths with no gap between them. I’ve tried building one of these before with a laths gap between laths, but it doesn’t work as you can then see the roof sheeting clearly. Because the laths are not a regular uniform thickness all the way along, you still do get some gaps, even if placing them side by side, which allows light through but takes away the view from beneath of the roof sheeting. We added a step on the front, as the top of the deck was more than 200mm off the ground on the front so this made for easy access to the garden from the deck. In the pics alongside you can see the roof sheeting on before we placed our thatching laths on. We’ve also previously used a translucent bronze roof sheeting which works very well to cut the glare from the sun. The polycarbonate roof sheeting is far better than fibre glass roof sheeting, albeit more expensive, as it doesn’t contain strands as the fibre glass sheeting does. 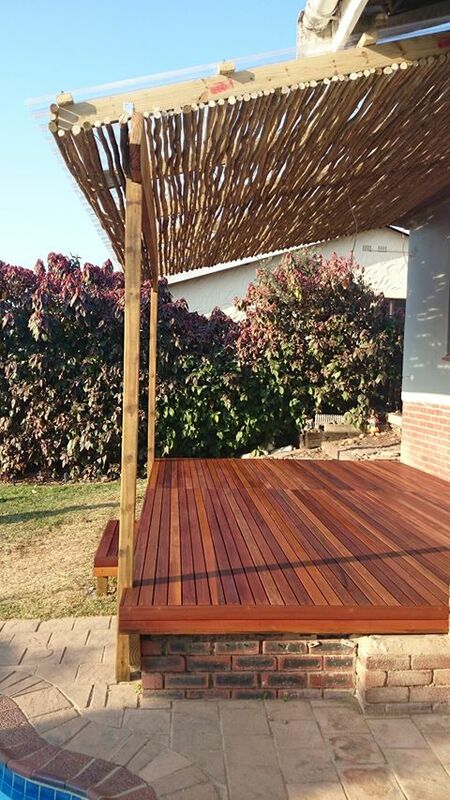 For a free no obligation quote on your wooden deck, pergola or any other outdoor wooden construction, please call us on 031 – 762 1795 or use the contact us form below.